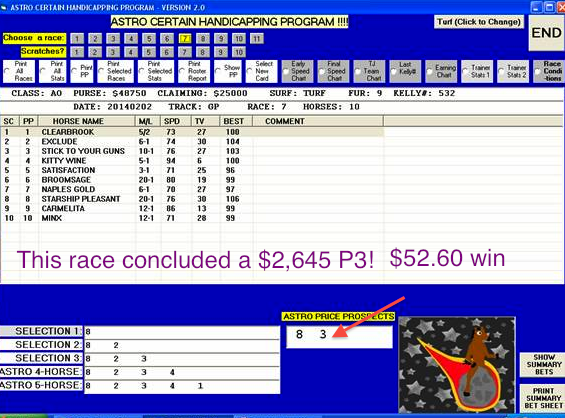 The Astro-Certain Software — Numerology Applied to Selecting Winners at The Racetrack! Works on Thoroughbreds, Quarters, Harness! Includes Jerry’s State Lotto Magic Number Strategy FREE!!! *****And, speaking of numerology (which is as good a way as any to lead into our main topic here), we were taken aback, several years ago, when Jerry Howell first sent us his Astro Tote Board Selector. 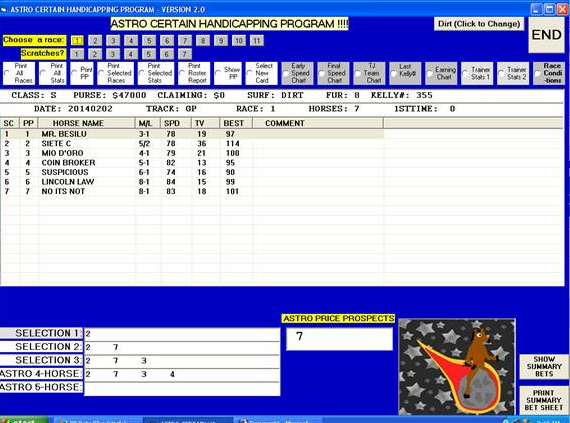 We laughed at first, but were somewhat stunned when our testing showed Astro Tote to be one of the most accurate prognosticators of winning Exactas, Trifectas, Superfectas, etc, we had ever seen. This past summer we marketed an updated version of Astro Tote in book form, and the response was terrific, as we received many calls and emails about just how often readers were cashing in on the types of exotic payoffs that most of us just dream about. The paper & pencil version was a bit tedious, and many enthused users asked for a software version. The Astro-Certain/Magic Numbers Selector, The Software! So you will now simply let the Software do all the work for you and display the Numerologic formulas for your exotic wagers onscreen. And, with the software version, you no longer have to monitor the toteboard! but here’s a brief explanation of why so many, people, including philosophers and scientists, feel that it indeed has an influence on our daily lives. —–According to numerologists, everything in the world is dependent upon the mystical properties of numbers. These properties come from the numbers’ inherent vibration. As the theory goes, each number has a unique vibration, giving it certain properties. These properties can shed light onto a person’s behavior or predict whether romantic partners are compatible. 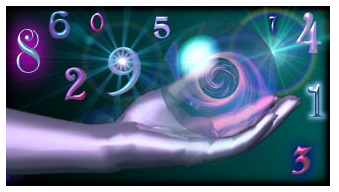 Numerological analysis can determine a person’s lucky number or lucky day. Recurring numbers can offer clues into how the world works or the significance of people and events . According to many numerologists, nothing happens by accident — everything happens because of numbers. Most numerologists credit Pythagoras with founding the field of numerology. Pythagoras was a philosopher who was born in Greece around 569 B.C. Pythagoras and his followers believed in mystical properties of numbers. 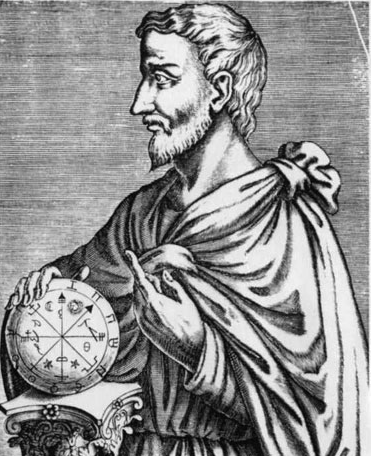 According to Underwood Dudley, author of “Numerology: Or What Pythagoras Wrought”, the Pythagoreans became interested in number mysticism after discovering a particularly fascinating fact about numbers. If you add up a series of odd numbers beginning with the number one, the result is always a square number. Discoveries like this led the Pythagoreans to the conclusion that “all is number.” According to one interpretation, this means that people can measure everything in the world and describe it in terms of numbers and proportions. This is a reasonable idea, and it has had a big influence on science and mathematics. But according to another interpretation, “all is number” means that everything in the world is made of numbers and can be reduced to a numerical value. The latter interpretation is the foundation of numerology. From a pure ‘fun’ (not to mention ‘profit’ perspective), this one takes the cake, as small exotic wagers often translate into outsized payoffs! Between Christmas & New Years Day, using just Santa Anita, Aqueduct & Tampa Bay, Astro Tote landed Superfectas of $6,891, $3,343, $2,981 (+ a dozen others), Trifectas of $1,122, $979, $816, $814, + many more and a Super Hi Five at ‘Anita for $3,513! 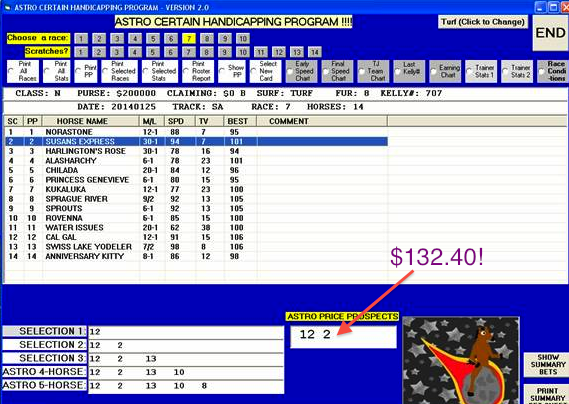 **Now, you will find your most lucrative situations in Exactas, Trifectas & Superfectas and Super HighFives. And the beauty of making these wagers these days is that you don’t have to be a heavy player to handle these wagers. Most tracks now have 10-cent Superfectas and 50-cent Trifectas & Super HighFives. A .10 box in the Superfecta for four horses is just 2.40, for example. So if you were betting on the Saratoga race above where Astro Tote hit a $4,954.00 Superfecta for every dollar wagered, you would still collect $495 – for a $2.40 wager! I did Aqueduct just on morning line. Here are the results. You are right! The system is awesome. Race 8 7-12-3-6 tri $146 Super $872 !! Not huge payouts but great results. as Fast – Turf Good. PIC 3″s increase significantly as we move on. At this point we are 7 races and 7 winners! Seven winners out of the first seven races is remarkable. That is a very good 52.60 win in the 7th race and it is a turf race. Top 2 were 7 1 1 won the race 7 second exacta $381.60 This was a grade 1 Turf race! Below a couple of screenshots from the above day. Winner, Exacta & Trifecta in 1st race. Things were really rolling on this day, as the Astro-Certain numbers ran consecutively for 7 races, resulting in several Daily Doubles & Pick 3’s. Astro-Certain numbers tend to run in streaks. Some days are redhot like the above — other days are just so-so, but you are always cashing something, often a BIG something. On the below day at Santa Anita not much was happening early in the card — a couple Exactas, a Trifecta, a couple low-priced winners, then BAM! 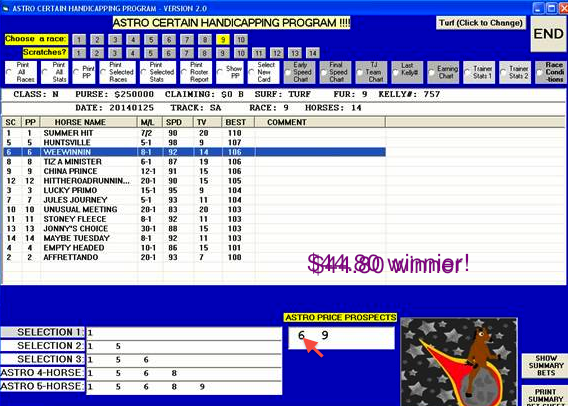 : a $132 winner in the 7th and a $44.80 winner in the 9th! that it will highlight what we call ‘Astro Price Prospects’ (see box to lower right of screenshot). Since there are at least four Astro-Certain numbers for every race, obviously a lot of winners will come from those numbers. However, very often one of those winners is a price horse, at times a BIG PRICE horse. Many of these big prices place and show as well, so we recommend to wager as follows: 1 unit win, 2 units place, 4 units show in fields of 8 horses or more. The Astro-Certain Numerology Software is just $155, which is probably less than the first Trifecta you will hit. Give it a try! +++Includes FREE! Jerry’s New State Lotto Strategy using Astro Certain!